These 17 photos are from my two-day visit in July 2007 to Unalaska (Dutch Harbor) in the western Aleutians, where I started a week-and-a-half-long vacation covering various places on the south Alaska coast. I lucked into unusually sunny (but still cool) weather, instead of the cold, damp, and dreary conditions common in the Aleutians even in mid-summer. Unalaska is certainly very Alaskan. 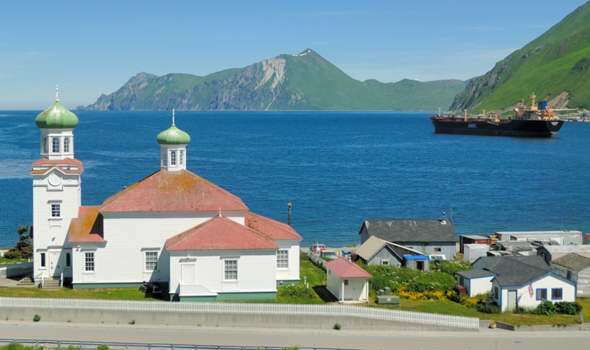 The seemingly paradoxical name evolved, with help from the Russian colonists, from its original Aleut place name, based on its location on islands near the Alaska Peninsula. 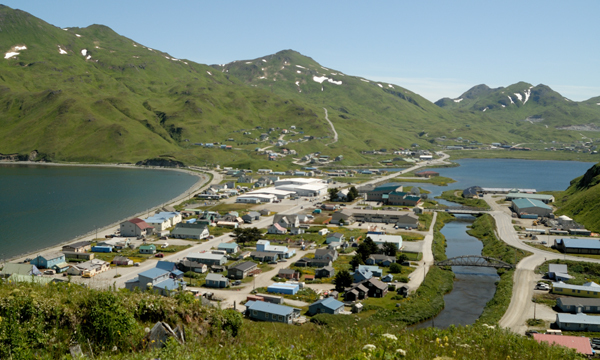 Unalaska's port, centered on Dutch Harbor but also including some smaller harbors, bills itself as the #1 fishing port in the United States, and certainly much of the town (especially in the immediate port area) has the heavy industrial look of the typical seaport. But gorgeous scenery can be found too, weather permitting. 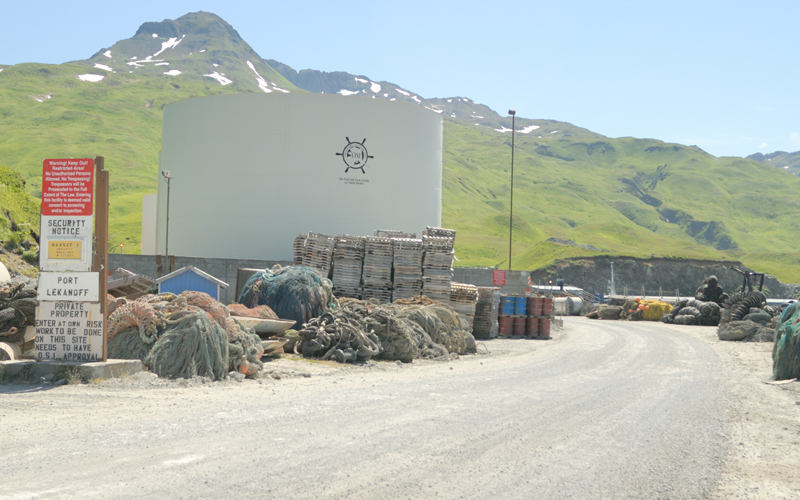 And on the west side of Unalaska is the westernmost point you can drive to from the main North American highway network (via the very long Alaska Marine Highway auto ferry connection between Homer on the mainland and Unalaska, which operates part of the year). That is also the westernmost point I've ever been to. This Unalaska welcome sign (as far as I know, the city's only one) is in the baggage claim area of the Dutch Harbor airport, which along with the harbor is on Amaknak Island (surrounded on three sides by the much larger Unalaska Island, where Unalaska's town center is located). The sign distinguishes between the port of Dutch Harbor (including the airport), and the city of Unalaska of which it is part. 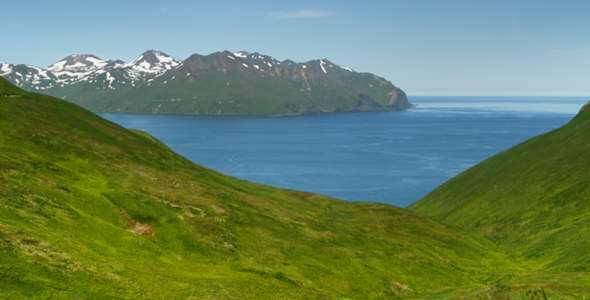 Those names are sometimes used interchangeably, which can result in some confusion in airline bookings when people look for Unalaska's airport (its location is listed as Dutch Harbor, airport code DUT). The logo accents the extreme western location in the Aleutians, at longitude 166° 32' W, as well as the sea lanes connecting Dutch Harbor to both the U.S. mainland and the Far East. Much as the airport's managers might yearn to handle trans-polar and other long-haul flights, its 3900' runway is too short for most jets, and its longest scheduled flights are PenAir turboprops to and from Anchorage. This photo of the airport runway, from the west on the south shore of Unalaska Bay on Amaknak Island, shows some of the reasons why the runway is so short, and why landings at the airport (always from the north, over Unalaska Bay) can be a little unnerving. 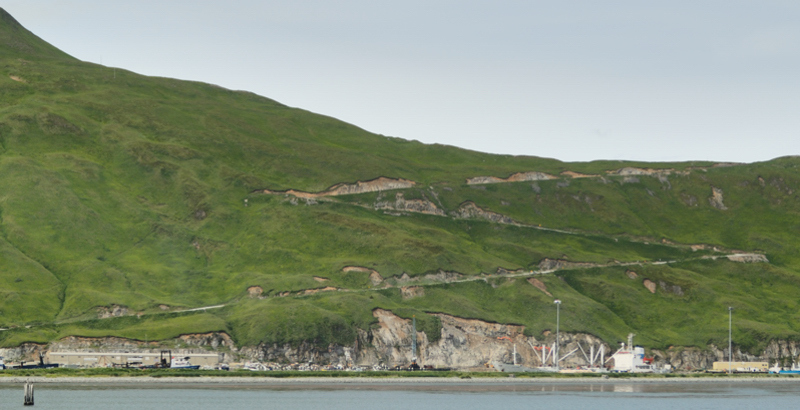 There just isn't a lot of flat land to spare anywhere in Unalaska, so the airport had to be wedged into a site with a sharp dropoff into deep water at the north end of the runway (left), and with Mount Ballyhoo's slope cut back a little to make more room for the runway. The other end of the runway, not visible here but a little south of the terminal and parking lot (right) is also constrained by the waters of Dutch Harbor, and the access road along the harbor's north side. On the beach in the foreground is the remnant of a concrete bunker. 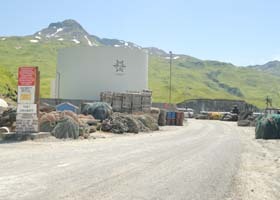 Many such reminders of the military presence in the Unalaska area during World War II remain throughout the area, particularly in the Aleutian World War II National Historical Area east of the airport. From my room at the Grand Aleutian Hotel near the airport, this view of Unalaska Bay's south shore. 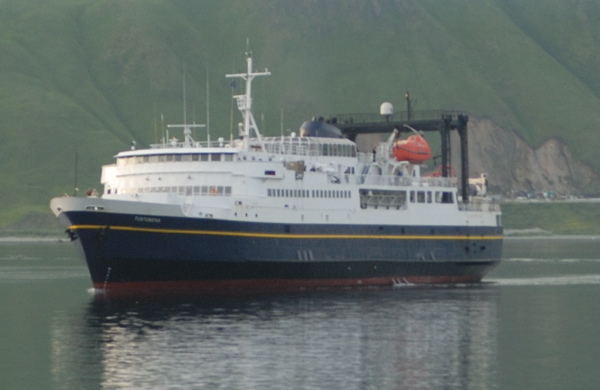 (The hotel's nice and the best in town -- though with four-star prices due to its remote location -- but there's no escaping that Unalaska's mainly about fishing and shipping.) In the foreground is another old World War II concrete bunker. Behind it is a bike path and two-lane Airport Beach Road, which runs from Unalaska's town center on Unalaska Island east to the airport and Dutch Harbor on Amaknak Island. 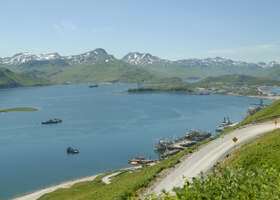 Unlike most of the other roads in Unalaska, 2.87-mile Airport Beach Road is paved between the town center and the airport (the 0.12 miles from the airport to the harbor is unpaved). From Ballyhoo Road, east of the airport along the north shore of Dutch Harbor, Ulakta Drive zigzags up the slopes of Mount Ballyhoo, to some great scenic views up top and from there to the Aleutian World War II National Historical Area. Ulakta Drive is unpaved, steep and narrow (much of it is one-lane), with hairpin curves. Fortunately, the local car rental companies have lots of old high-clearance pickups and SUVs in their inventories that can handle the road, and also the even narrower roads within the historical area. I took this photo from the Alaska Marine Highway ferry M/V Tustumena, on my way out of Unalaska. 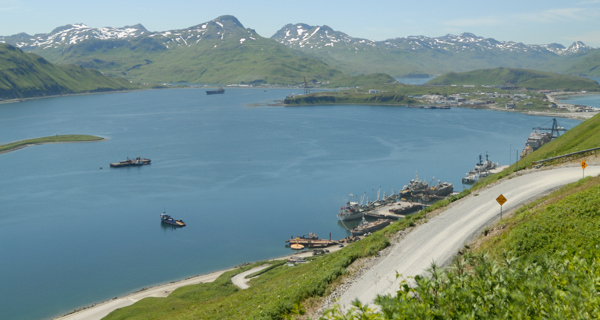 One of the pullouts near the top of Ulakta Drive offers a great view to the south from above of Dutch Harbor, both its east end and the breakwater (left) and its west end (right). 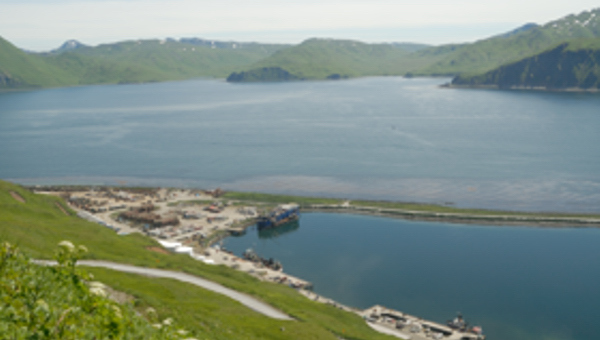 The southern part of Unalaska Island is in the background of both photos, across Iliuliuk Bay. From the top of Ulakta Drive, a gorgeous view north across Unalaska Bay of the snow-capped (even in late July!) 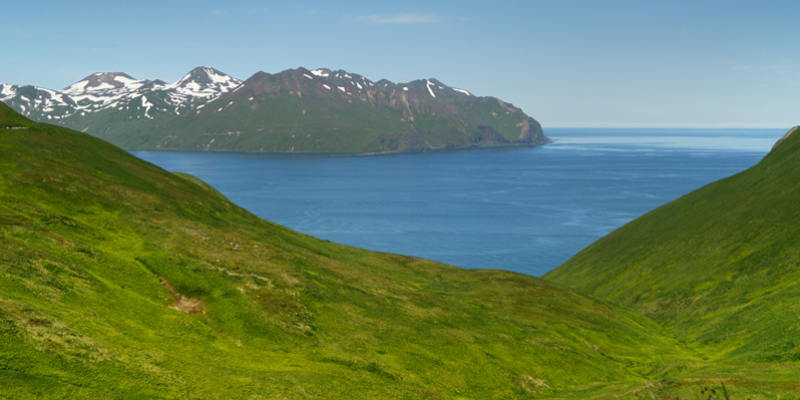 mountains of the unpopulated Cape Cheerful area of northern Unalaska Island. 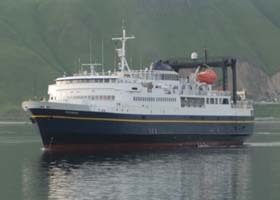 The Alaska Marine Highway System auto ferry M/V Tustumena, approaching the dock in Dutch Harbor at the end of its four-day journey from Homer. I would later that day catch the ferry on its return trip, getting off about mid-way at the small town of Chignik on the Alaska Peninsula to connect to a pair of flights back to Anchorage. 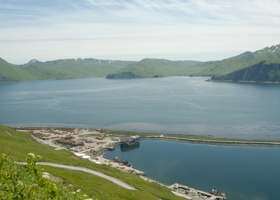 The bridge above right between Unalaska Island and Amaknak Island, viewed from the south on Raven Way on Haystack Hill, is officially the "South Channel Bridge," but is locally known as the "Bridge to the Other Side." Given Alaska's reputation for "bridges to nowhere," it's good to know this bridge actually goes somewhere ;-) As the only link between Unalaska's town center and the Captains Bay industrial docks on Unalaska Island, and the airport and Dutch Harbor on Amaknak Island, this bridge is actually pretty busy. The existing bridge is not that old, but already can't handle the heavy truck and other traffic, with a sometimes slippery wooden deck and deteriorating piers. 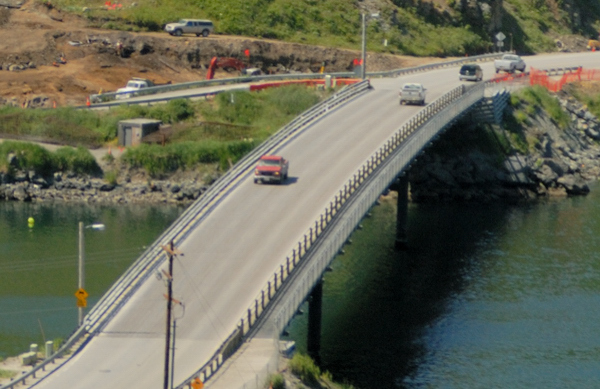 So Alaska DOT&PF has started construction of a replacement, to the left (west) of the old bridge. 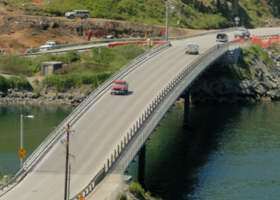 There was some local controversy last year over whether to start construction as soon as possible, or wait a few years for a full archeological dig of an ancient native village at one of the approaches to the new bridge; but given the condition of the old bridge, and its importance to the local economy, the "expedite construction" option won out. A closeup view of the existing bridge. The main vehicle deck is wooden; a steel-grate pedestrian/bike path is cantilevered off the right (east) side of the bridge. The west side of the existing bridge, from near its northern end. In the right background is Haystack Hill, topped with faintly-visible radio towers. A telephoto view of the east side of the existing bridge, and behind it some of the construction work on the new bridge, from Amaknak Island across Iliuliuk Harbor. On Unalaska Island, the west end of unpaved Captains Bay Road, at the entrance to Port Lekanoff (private road beyond red "no trespassing" sign), is the westernmost public road in Unalaska, and at 166° 34.736' W 53° 50.823' N also the westernmost place I've ever been. It also is the westernmost point on the continuous North American highway system, if you count the Alaska Marine Highway auto ferry connection between Homer and Unalaska. However, unlike the traditional "westernmost point" in Anchor Point State Park north of Homer, very few tourists drive here from the Alaska mainland or elsewhere in North America, since from the mainland transporting a car on the ferry to and from Unalaska (operates only once a month in the summer, and not at all the rest of the year) takes about a week, and costs over $2000. Back to Haystack Hill on Unalaska Island, a view to the south of Unalaska town center, from a pullout on Trapper Drive most of the way up to the radio towers on top of the hill. Airport Beach Road from Dutch Harbor follows the Iliuliuk River outlet from Unalaska Lake, to the second bridge across the river at 5th Street (the other bridge is a pedestrian-only crossing at 3rd Street). 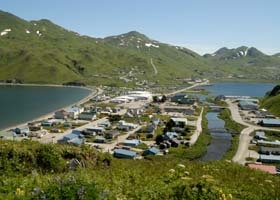 The long straight road from the lower left corner to the upper right is Broadway Avenue, Unalaska's other paved main road. From Haystack Drive lower on Haystack Hill, a great view to the east of Iliuliuk Bay. 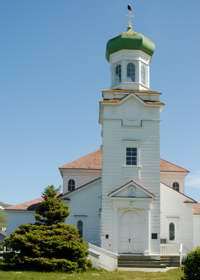 On the left, along Broadway Avenue, is the historic Holy Ascension Russian Orthodox Cathedral, which was completed in 1896. The front of the cathedral on its northern side, with a bald eagle perched on top of one of its crosses (he or one of his friends was there most every time I passed by the church). Bald eagles were a dime a dozen in Unalaska (at least the part on Unalaska Island), atop many roofs and other high places. As can be seen in this closeup, bald eagles can be a mixed blessing. 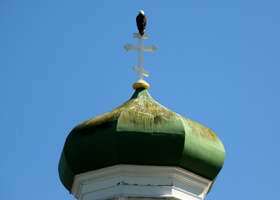 With eagles come eagle poop, staining the onion dome under the cross.